This document shares suggestions of games you can buy which encourage speech at different levels. The games are roughly listed in order of increasing communication load. When sliding in we have to consider three variables: People, location and activity. The activity variable is important as it is what will distract your child from their anxious feelings. The choice of activity therefore is very important as it must not create unmanageable anxiety in the process. To avoid this activities need to be worked through systematically starting with low communication load, through to medium communication load then up to high communication load activities. Please refer to the Selective Mutism Resource Manual (Second Edition) for further information on communication load. As well as considerations for communication load, your child’s developmental age and interests must also be taken into account. Choose games that they enjoy and are adept at. Pre-practicing games at home is a really good way to find out if your child likes a game and is not too easy or too difficult for them. It gives them the opportunity to become a pro at it before taking it into school so this way your child will be really confident with the game during sliding in helping reducing anxiety further. It’s worth noting that some of the games below can be adapted to make them easier if needed – you don’t necessarily have to follow the exact instructions on the box. The easiest version of the games have been listed but some alternative suggestions for older children are included. 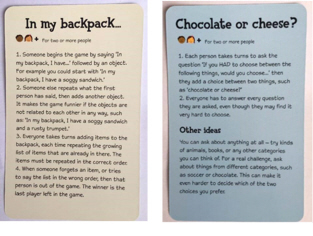 The Selective Mutism Resource Manual (Second Edition) contains many activity ideas that are free, plus it is worth bearing in mind that some of the games below can be played on paper or in another improvised way. However if your child loves tangible, colourful board and card games then the games listed here provide great options for fun distractions. To view a version of this document with pictures of the games/books, please download the PDF file (link at bottom of page). The farm cards are spread out, face down, on the table. Children must collect all the matching farm cards and farmer shown on the farm lotto boards. Play begins by turning over a farm card. If the card illustration is shown on the player’s farm board, then the player makes the noise or action of the subject on the farm card and then places the card on the matching square on their board. Once all the animals are collected children must find their matching farmer. The winner is the first to complete their lotto board. Each card is printed with a coloured spot on one side and an animal illustration on the other. The object of the game is to collect as many cards as you can by correctly guessing the hidden animal. The cards are all spread face down on the table, with the coloured spot side up. Players take it in turn to throw the die and choose a card with a matching coloured spot. Before turning the card over to see if they are correct, they have to make the noise of the animal they think it is. If they guess the animal correctly, they can keep the card and play again. The aim is to win all the cards in the pack. Each card in the deck is broken down into categories and each category has a score value. Play begins by one player picking a category from their top card and reads out the score value. The other players then read out their value from their top card for the same item. The player with the highest value wins and takes all the losing cards and places them on the bottom of their pile. The good thing about Top trumps is that you can buy a deck to suit almost any interest – Football, Disney princesses, Insects, Harry Potter, the list could go on and on! Players advance round the board, naming animals beginning with a certain letter. There are lots of animal pictures on the board that children can name to help them along if needed. There are two different gameplay levels. With the harder level animals also have to fit into a certain category determined by the roll of a dice (Air, Land or Water), for example a land animal beginning with ‘A’ or something that can fly beginning with ‘C’. For extra fun, players have to do impressions of certain animals throughout the game. Snap – children aged 3-8 years for this particular version although alternative Snap cards can be sourced to suit any age. Players say ‘Snap!’ when they spot matching pairs, plus with this twist on the traditional game when players spot a pair of crocodiles they must snap their arms instead. Each card is decorated with eight different symbols varying in size and orientation. There are five different ways to play. Be the fastest to spot the identical symbol between two cards, call out the symbol and then take the card. Place it or discard it depending on the rules of the mini-game you’re currently playing. It’s like a harder version of Snap. The aim of the game is to sink all of the opponent’s ships by correctly guessing their location. Each player has a board with two grids. Players secretly place their ships on the lower grid. Players take turns firing a shot to attack enemy ships by calling out a letter and a number of a row and column on the grid. The opponent checks that space on their lower grid and says “miss” if there are no ships there, or “hit” if you guessed a space that contained a ship. Mark your shots on your upper grid, with white pegs for misses and red pegs for hits, to keep track of your guesses. Players choose which character they’re going to be and then take it in turns to ask questions and make guesses at each other’s characters. The first to guess correctly wins. There is the standard Guess Who game and the electronic version. The electronic one is good as game set up is easier (no tiny cards to slot in) and there are interchangeable character sheets giving you 144 diverse characters including a sheet of aliens and a sheet of animals amongst others. Players are dealt a number of cards then a player begins by asking another player for a specific card so that they can match a pair of sea creatures. If they have it they must pass it over and the player can continue their go by asking a player for a different card. If the chosen opponent does not have their sought after card play passes to them and instead the player must say ‘Go Fish’ and pick up a card from the middle. Older children could play this game with a standard deck of cards matching up sets of four instead of pairs. The object of the game is to collect as many families as possible. Play starts by one player asking another for a specific card needed to complete a family. If the other player has the card they must hand it over then continue their turn asking for another card. When a card is asked for that that player doesn’t have play passes to that player next. The player who collects the most complete family sets is the winner! Each player takes a headband and adjusts it around his or her head. Players then place a card into the clip of his or her headband being sure not to look at it. Players flip the timer then ask each of the players a question that will help them figure out what the picture is on their head. To begin, one player takes a card, reads the quick fire questions to the opponent, if they answer Yes! Or No! the reading player rings the bell and keeps the card. If they get to the end of the questions without saying Yes or No – the opponent keeps the card. Players begin by turning over one of the cards depicted with a familiar scene. Taking it in turns to hold the bomb, they must name something that would fit into the picture and pass the bomb to the next player before it goes off in their hands. For older children ‘Pass the Bomb’ could be purchased in which players shout out a word that contains the letters on the card and pass the bomb before it ‘explodes’. There are three levels of play. The difficulty levels are determined by how many words you are NOT allowed to say as you try to get your team to guess the main word. If the player is able to get his/her team to guess the main word they continue play and move onto the next card and the next card until the long buzzer sounds. If the player mentions any of the forbidden words, a member of the opposing team presses the buzzer and the card is removed causing points to be deducted at the end of the turn when the score is calculated. There are nine dice, each with a unique image on all sides, 54 images in total. This means that with every roll, there are over a million combinations to use for storytelling inspiration! Roll all nine dice, then, starting with ‘Once upon a time…’ select the icon that catches your eye first. The objective is to tell a story that link together all nine images. There are no wrong answers. There are many more different ways you can use story cubes. Look on the internet for a wide variety of ideas. Six multicoloured cubes with different conversation starters printed on each side. There are lots of different ways to play, either in pairs, small groups or large groups. One way to play is to give a group a cube and have one person in the group roll the cube, ask the question and respond. The rest of the group should carry on the conversation by asking more questions or providing their own answers. Look on the internet for more ideas on different ways to play.